Hold on to your hats – Virginia is about to blow away!! I spent my morning reading in bed. Resistance is great – and I don’t even like wartime books! It’s detailed, swiftly moving and suspenseful – just what I like in a good book. You’d think a lazy morning at home would be the perfect day, but it actually leaves me feeling rather blah. I keep waiting for my body to feel sick or hungover, since that’s usually how I feel when I’m still in my pajamas at lunchtime and haven’t done a thing! I did eat this killer salad though. 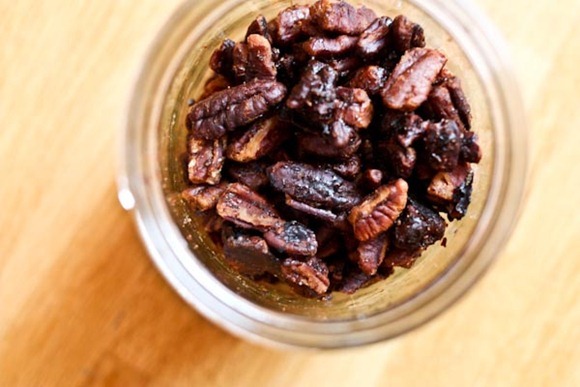 Those spiced pecans were made by Matt last night for our event tonight. They are modeled after a Great Harvest recipe, so unfortunately I can’t share it, but I’ll let you know that this recipe is pretty darn similar! I think I ate half a jar! So addicting! After lunch Pero with a House Hunters. Somebody needs to get up and get moving! 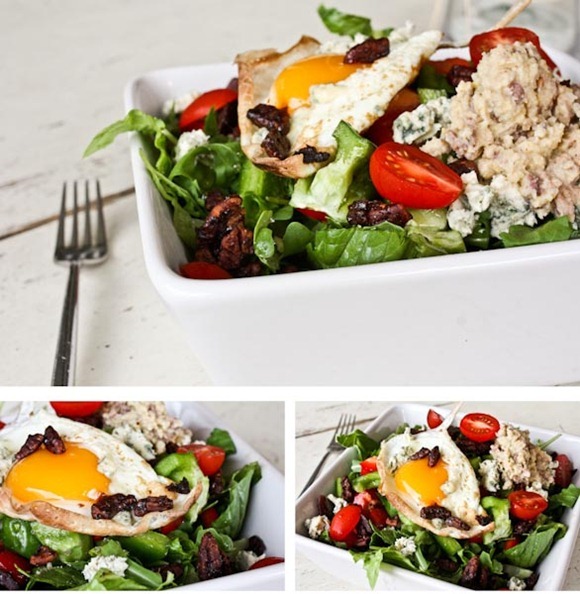 Blue cheese with eggs is wonderful! I made Runny-yolk sliders with blue cheese a few weeks ago, SO GOOD! Ha ha, I’m so addicted to House Hunters! For some reason I find it incredibly relaxing, especially the international ones where they’re moving to Belize or something. Anyway, your salad looks amazing. You make salads look so fabulous! Once again, I will have to get some lavender salt. By the way, since you always say how you eat dates, and how they tie you over for a while until your next meal, I just happened to find some organic ones today and bought them. I am excited to see how they make me feel. Up and at ’em, Girlfriend! Like you, I’m having lazy day, but I think you probably deserve it way more than I do. The salad looks great, and I hope the rest of your day is enjoyable too. love love love egg on salads! Wow! Amazing looking salad! Especially that egg! My day has been pretty much the same, minus that delicious looking salad! I love House Hunters! I like hearing all of the differences in peoples opinions of space, such as the yard or kitchen. It’s really interesting to me! Plus, watching the International one, it’s so neat to see all the different places. I’m having a lazy Saturday too! Enjoy it, you certainly deserve it. Pretty salad—ummmm I LOVE staying in my PJs as long as possibel–actually, scratch that-I like getting up, working out, then getting back in to my PJs after showering. haha 🙂 ENjoy the day! Nice salad!! I always feel super tired if I just lay around all day. Its super rainy and windy here in PA too. You are right about the weather in VA! We live in Norfolk and the wind is CRAZY! Nice lookin’ salad Kath, I think the runny egg would be a fun twist, yum! For the last few months, after seeing it here, I’ve been putting olive oil and honey on my salads, and it’s my absolute favorite. Now I just need to find some (or make some) lavendar salt too! Sounds like a nice, lazy kind of Saturday. My kids are both sick so I spent the morning under my down comforter reading while they napped. Now I feel like I have lost the entire day. I love the relaxation but then hate the unproductivity. Who’s the author on this one? Is it Owen Sheers? Looking for more books to add to my Kindle. I don’t know if I missed it but what exactly is Perro? 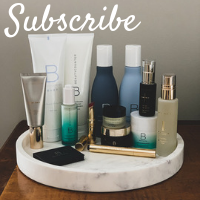 Click the link I provided! Spiced nuts are soooo good. And so addicting. Over the holidays in the malls when you smell spiced nuts roasting, they are like a beckon, calling me over! That’s the perfect reason to take a break… yum! 😉 I love the egg you added into the salad too! Looks like such a great mix. i’m often in my pj’s in bed for a good portion of the morning. it definitely helps if some housework gets done, but it sounds like you already did that! That salad suits spring! Unfortunately it’s snowing here! Love the vibrant yellow of the yolk! It’s windy windy here, too!! We had horrible weather last night, and the wind stuck around. Hope ya’ll don’t get blown away! Enjoy your day! 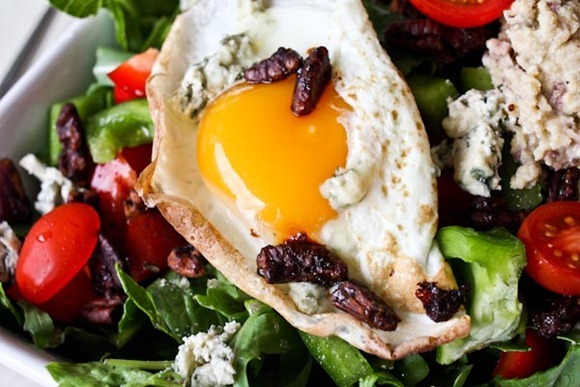 That salad with the egg looks delicious! I have a question on fueling before a workout. I have seen that you have used dates before a workout. I typically out first thing in the morning 5AM and have a hard time eating before I go. 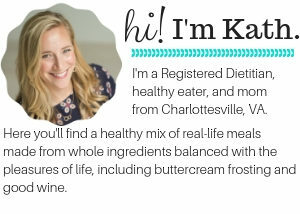 Do you have any suggestions on what I could do for fueling or do you think a date would be sufficient? I plot it into my Circulon pan with some Misto spray and just let it sit on medium heat! I can only handle so much lazing around too. At some point I need to get out of the house or else I go crazy! I love lazy reading days 🙂 I hope you do a book review! Love the lunch.. and the pecans, those are my favorite nuts. I wonder if you have ever had pecan butter?! I have and didn’t love it! I think it was a bit too earthy for me? I’ve never thought about putting an egg on my salad! I guess it makes sense, I use hard boiled all of the time! That is not just “an egg.” That is the PERFECT egg!!! You deserve a day of rest! You are the most active person! I love Saturday mornings where no plans are involved. I get to clean, cook and relax! Beautiful salad! I totally identify with your sentiment about just laying around….as great as it feels, it’s so foreign….and can feel kinda gross after a while. This salad looks AH-mazing!!! Btw you are looking exceptionally beautiful lately, your hair is getting so long and you are radiant! 😀 The hubs and I watch House Hunters all.the.time. How fun of a show is it? We already own a house, but we love love love watching people go through the process and House Hunters International makes us yearn for some time abroad! 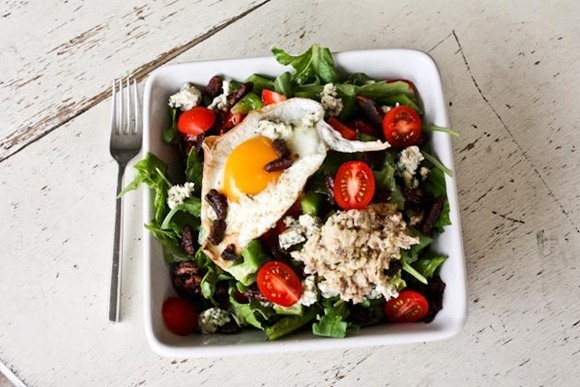 The egg would be hard enough for me to make; the rest of the salad combination looks like too much to handle! I love that hummus is part of the salad, though, rather than a side. 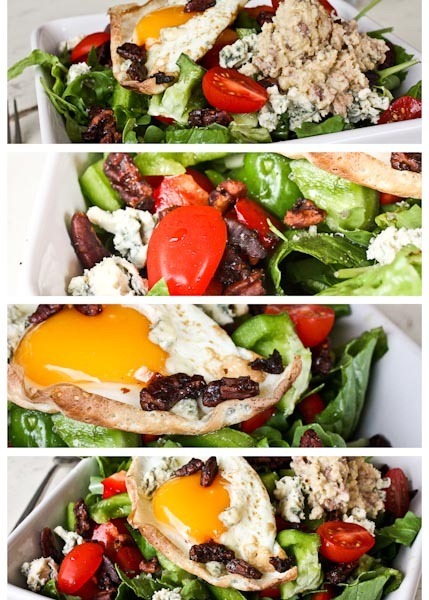 I keep forgetting to try a fried egg on my salads…every time I see it on your blog it looks so yummy!